1 Millon Steps 4 OCD Walk!!! Are repetitive thoughts affecting your life? Hear from experts in treating OCD about effective strategies and approaches for individuals and families and living with OCD. Date and Time: May 17, 2018 6:30-8:00 p.m.
Mid-Atlantic Board Members Carter Waddell (parent), Nicole Perras, M.D. and Carrie Holl, Psy.D. The presentation explores adaptations of traditional CBT techniques specifically focused for working with clients with OCD. Key elements for developing an effective intervention plan. Following the presentation, there will be an opportunity for discussion and Q&A. 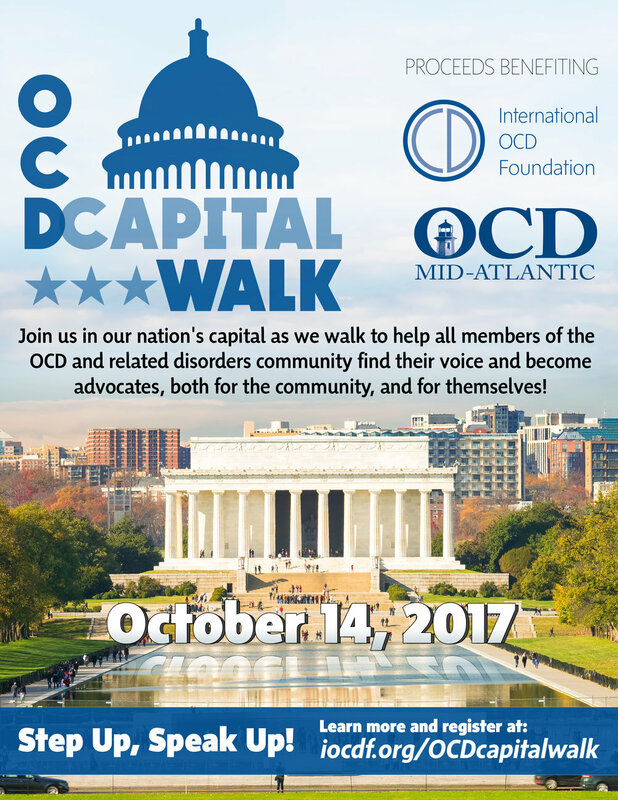 Join us in our nation's capital as we walk to help all members of the OCD and related disorders community find their voice and become advocates, both for the community, and for themselves! Proceeds benefit International OCD Foundation (IOCDF) and OCD MidAtlantic. Location: National Mall, adjacent to 3rd St SW (between Madison Dr NW and Jefferson Dr SW), Washington, D.C.
Richmond, VA event! OCD Awareness presents OCD Connect! -Do Unpleasant and unwanted thoughts or images repeatedly enter your mind? -Do you feel driven to repeat certain acts, like checking or washing, over and over again? -Have you wondered if you, or a loved one, might have OCD? -If you have OCD, have you wondered how to find effective help? 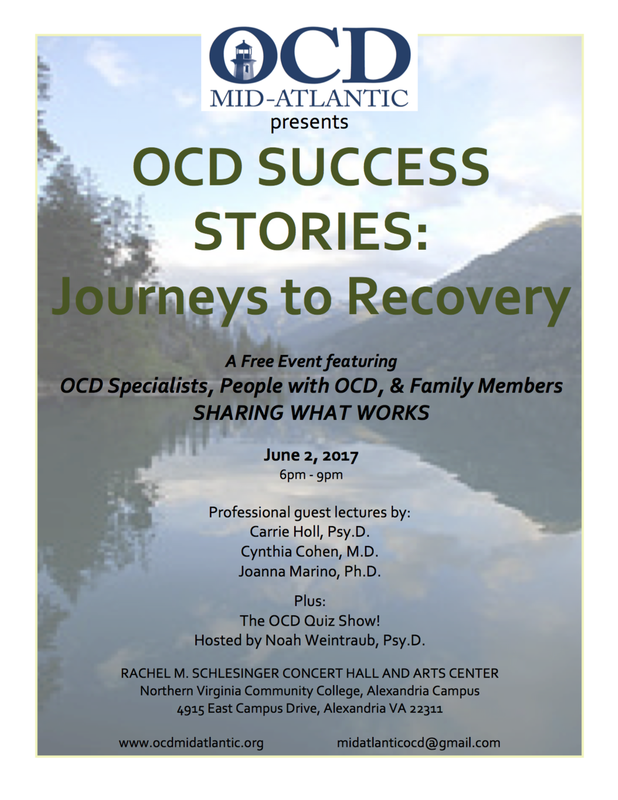 Learn about OCD and evidence-based treatment from Richmond area psychologists, psychiatrists, and therapists as well as courageous individuals and family members affected by OCD directly. Topics include common OCD themes, incorporating mindfulness in treatment, challenging faulty beliefs, generalized anxiety disorder, the role of medication, and helping children with OCD. Hosted by Noah Weintraub, Psy.D. 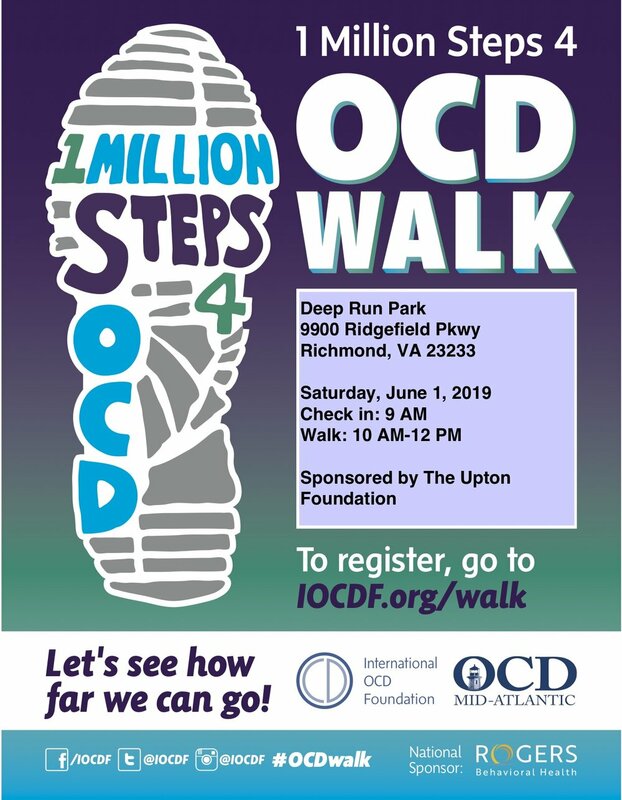 Sponsored by the International OCD Foundation's Mid-Atlantic Affiliate. A free event for sufferers, their loved ones, and mental health professionals interested in learning more about OCD and how to support one another. Parking is free. Complimentary refreshments included. National Presbyterian School is easily reached by public transportation. It is a short walk from the Tenleytown-AU Metro station (Red Line) and the M4 and N2 Metro Bus lines stop right out front. A free event for OCD sufferers, their family members, and mental health professionals interested in learning more about the disorder and how to support one another. Presenters will focus on family members' relationship with the sufferer's OCD symptoms- how family members are affected, involved and can be helpful in the sufferer's recovery. Topics to be covered are family accommodation, co-occurring disorders, hoarding, and medication. Evening With the OCD Experts! Parking: MedStar Georgetown University Hospital is located on Reservoir Road across from 38th St. NW. You should come into Entrance 1 and park in the Leavey Center Garage (straight back past the second stop sign). The last building on the right is the Pasquerilla Healthcare Center. Please enter here and the staff located at the desk by the entrance can direct you to Gorman Auditorium. Northern Virginia- Meet the Experts! Presentations: Panelists will give brief presentations describing their areas of interest or their experiences with OCD. For the bulk of the evening, panelists will respond to comments and questions raised by audience members. An Evening with the Experts!